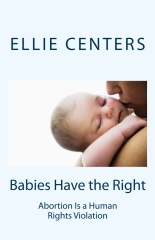 This book is based on a paper that Ellie Centers composed during her high school years. Shortly after her death, her work was discovered by her college president, and with her parents’ permission, he chose to publish Ellie’s message. Chapter one is comprised of that message. Chapter two offers a number of relevant scriptures to consider. Chapter three suggests pro-life help that may be available for women who are in a crisis pregnancy situation. ELLIE CENTERS of South Lebanon, Ohio was a graduate from Kings High School and a student at Valor Christian College in Columbus, Ohio. Ellie was a disciple of Jesus Christ and a voice for the unborn. Her passing in January of 2017 was untimely, but her message carries on. At the request of Ellie's family, proceeds from the sale of this book will go to Valor Christian College and the Women's Clinic of Columbus (a ministry of World Harvest Church).